The NSW Department of Transport says it is investigating a runway extension at Lord Howe Island Airport after signing a new four-year deal with QantasLink to maintain air links to the island. Lord Howe Island Airport, located about 425nm east of Sydney in the Pacific Ocean, has a single runway in an east-west orientation that is 866m in length, which limits the types of aircraft that can operate there. Currently, QantasLink schedules up to 19 flights a week to Lord Howe Island from Sydney, as well as some seasonal services from Port Macquarie, with 36-seat Bombardier Dash 8 Q200 turboprops, the smallest aircraft type in the Qantas fleet. The contract extension means QantasLink will continue to serve Lord Howe Island after the current contract expires in March. “Securing ongoing service to this important island community is a great result. The community’s vibrant tourism industry along with its health and education needs rely on regular flights between Sydney and the island,” Minister for Transport and Infrastructure Andrew Constance said in a statement. Member for Port Macquarie Leslie Williams said the Lord Howe Island Board was “conscious of the sensitive and pristine biodiversity” of the island, given it boasts the southern most coral reef in the world. “Lord Howe Island has a number of unique features that make providing air services challenging,” Williams said. QantasLink chief executive john Gissing noted Qantas had served Lord Howe Island for 70 years. “We’re committed to continuing to grow business and tourism opportunities for this unique destination on our network,” he said. 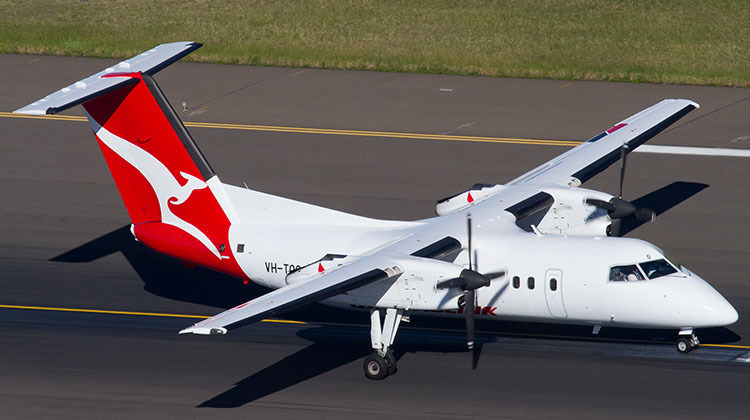 QantasLink operates three Q200s – VH-TQG, TGS and TQX – which were built in the mid-1990s. As well as serving Lord Howe Island they operate across the QantasLink NSW network, including from Sydney to Armidale, Coffs Harbour, Dubbo, Moree and Tamworth. This Youtube clip provides a good perspective on the geographical challenges of operating from Lord Howe Island, plus the Dash 8 Q200’s excellent field performance! Qantas’ john Gissing should review his Qantas history a bit better. Qantas has not served Lord Howe for 70 years. It seems he forgot that it was Ansett Flying Boat Services that maintained operations till the mid 1970’s, when the airstrip was completed. From that time various operators have operated services to the island include Oxley, Norfolk Island Airlines and Connellan. QF took over in the early 1990 as Eastern Airlines. Brings Memories of the caribou, what an ac that was, could land and take off on a postage stamp, well, maybe just. Never entered any ones mind what would happen if the pilot had a medical issue with a 10 year old in the cockpit, but they were different times…. What a waste of money for an island of just 300+ people, the extension into the lagoon will cost multi millions and destroy the environment which already suffers from the current airstrip just protruding into the lagoon. Qantas don’t want to give up this ‘milking cow’ as they regularly charge over $1000 for a return flight and the service is very poor with these dilapidated old aircraft! Lord Howe Island was served by Qantas Catalina flying boats in 1947. That’s 71 years ago. The paramount issue here is to preserve the beauty and pristine quality of the island. It was best when flying boats were used. The current arrangement was an unavoidable compromise in the 1970s but why do we need a runway extension? The current flights and runway seem adequate to provide for all the visitors that the island can accommodate – four hundred maximum at any one time. I think you’ll find it has most to do with QantasLink wanting to get rid of the 200 series Dash. They are the orphan of the fleet and only being held onto because of the island and some thinner routes. If they can make every runway in their network Q400, or at the least 300 capable then they are happy. I’m terms of the capacity of the island, say the runway is extended and they run 300’s there, that’s an increase of 14 people. If it’s the 400, it’s 42 more people. I’m quite sure the Lord Howe Island tourism operators wouldn’t say no to that.. So basically what the article is saying, without saying it in so many words, is that the Dash8 200s are coming to the end of their service life. As there is currently no other aircraft in the Qantaslink inventory which can utilise the present airfield, the runway needs to be extended. I doubt the island board has plans to significantly increase tourism to the island. There has for a long time been a well managed, fine balance between tourist numbers, island infrastructure, and maintaining the pristine destination. It is the serenity and beauty which are, after all, the island’s key drawcards. Upgrading the runway I expect has little to do with increasing numbers of travellers. It is more likely a necessity due to replacement aircraft types which require longer runway distances. I’m in agreement with @deano that $450,000 to “investigate” a runway extension is yet another dreadful waste of taxpayer funds. The government knows that the current operator of the route has aircraft which will soon have to be replaced. Just add the $450,000 to the cost of the runway extension by all means but don’t waste it on a separate investigation to tell the government the bleeding obvious! Regarding comments by @Scott and @ButFli, Qantas may well have operated flights to Lord Howe Island in 1947 however Qantas has not continually serviced the route for 70years as one could imply from reading the article. I’m with @Scott who clearly identified other key carriers which have over the years provided the primary air link between Lord Howe Island and the Australian mainland. Ansett’s Sandringham flying boat service is probably the most iconic operation on the route! As an aside, one of the Ansett Sandringhams, VH-BRC, is displayed wearing the 1970s ANSETT livery at the Southampton Hall of Aviation. The cabin is open for viewing and provides a wonderful insight to another era of aviation! Rather than Qantas spending money to replace the Dash-8-200s, they want the taxpayer to extend the runway so they can operate -400s. Does anybody not see the flaw here? If Qantas can’t or won’t replace the aircraft that can use the existing runway, let somebody else operate the route. You’re right. Problem is it pretty much has to be a Dash to do it and make it viable, due to the current length. So an established Dash 8 operator on the east coast. There’s only really 2 I know of. One is QLink. I’m also not sure (if anyone can enlighten me), is the Lord Howe route a Gov subsidy like QLinks western QLD/NSW routes? Anyway if you open it up a bit more then it becomes economical with SAAB’s/ATR’s and the like. Surely there are a number of new aircraft that could replace the Dash 200. I think that Qantas is playing games and only wants the government to chip in for the cost. Extending the runway would be impractical and environmentally stupid. There you go. I didn’t fully read the story. Cheers. Probably answers most of your questions. It would make sense to extend the runway to at least 1500 or 1600 metres.I think that would allow ops by Q400 or ATR and allow the early model Dash 8s to be honourably retired. I’m all for preserving the magnificent ecology of this natural wonder, but surely a runway extension to this length is possible if done sympathetically. It does worry me that this is just an investigation and no actual aspirational runway length is mentioned. As others have said – a waste of money. Spend more money up front and actually just announce you are going ahead with the project. Oh no hang on, that’s far too decisive and visionary. Qantas has not served the Island for 70 years. There is a fair bit of difference between serving it 70 years ago and serving it for 70 years. At only 866m the runway at LHI has ALWAYS been short! It’s LONG needed an extension (because there isn’t anywhere else for it to go). The current QLink 200’s already require a dispensation to be allowed to include the RESA in the take off distance to get adequate takeoff numbers. Sad truth of the fact is that Bombardier long ago stopped manufacturing anything smaller than the Q400. Those 200’s aren’t going to last for ever and without a runway extension there is no other machine that can do that run as an airline service with a viable payload. @James, ‘milking cow’? really? It’s just expensive to operate an orphan fleet with low payloads on a LONG sector to the middle of nowhere (literally). Nothing against LHI but 5hrs return of low yield flying is hardly in QF’s interests other than with the government’s assistance and a realistic fare. This isn’t 737’s in the ML-SY-BN triangle. @Craigy,, to which Ben were you referring? I’m the first post. Although I do broadly agree with Ben number 2 – yes well said! They can’t keep the early Dash 8s flying forever. There’s nothing currently comparable to that aircraft currently in production, You could possibly get a much smaller twin turboprop in there. I think Oxley Airlines flew there up until the early 1990’s. Not sure of the aircraft type, but I think something similar to a Piper Navajo (I know they were operating Beechcraft C99 when they changed to Impulse Airlines) I suppose the modern equivalent still in production is the King Air. If QFlink bought 3 or 4 of those, they don’t have the payload of the Dash 8 and would be an expensive subfleet. I remember reading somewhere that when they were planning the runway in the early 1970’s they wanted to make it at least 1200 metres or longer, to allow Fokker F27 ops. I don’t know why they just didn’t do the job properly back then. Lets hope this doesn’t just get bogged down in a study and something is actually announced. A possible new solution. It would lift at least as many as the Dash. Sorry to be picky or pedantic but: Qantas Link’s Dash 8-200 are NOT Q200, there is no such model. Qantas Link fly Dash8-200, Dash8-300, and Dash-Q400. The SAAB probably would not have the performance to do it. You are incorrect! As a matter of fact, all models from 100 to 400 were available as Q. It does stand for quiet, as in a noise cancelling system built into the fuselage. I believe it was an option from around 1997. I think you’ll find the first Sunstate Dash 8-200 series we’re in fact Q. Possibly Easterns are not. They may be somewhat older. Also John, ALL of Qantaslinks 300 series are Q300. Even the first one VH-SBB.